So, some brides are super crafty and talented and know their way around a computer. They choose to make cutesy little maps to match their invitations and that's all good. But me? I'm all for the easy way out on things (I feel) I can skimp on. Especially since I don't want a lot of inserts in the invitations. 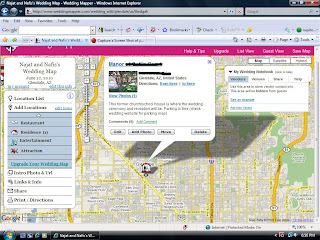 That's where http://www.weddingmapper.com/ comes in. Here you can make an accurate map of your own, you don't have to worry about drawing the lines yourself (isn't that ludicrous?) and there are cute icons to show your guests things like your ceremony/reception sites, parent's homes, and any other location pertinent to various wedding events. This way your guests can see everything all laid out on one map. Much better than having them lookup directions for each individual event, right? Above is a screen shot of mine, with the address of my ceremony site blocked out to reserve privacy. The online version is interactive. Guests (or you) can print the map and directions as well at will. It is really easy to set up your own map. You don't have to necessarily have all of your addresses ready-you can just search your location and the results will pop up (so far all of mine have been accurate). You can type in inforamation for each location that pops up in a comic-book like bubble for guests to read. You can even add photos and links to the business' website if you want. There are also great zoom in features. The free version of the map comes with icons for airports, hotels, residences, restaruants, ceremony/reception sites, entertainment, and attraction spots. You cna upload photos as well. I will definitely reserve a link for this on my wedding website. Let me know if any of you check it out!